Used to trigger the update subscription modal. See WEB-377 for details. All RBR instruments use a single piece of software: Ruskin. Compatible with PCs and Macs, it is the only application needed to deploy, download, and display the data from your logger. Even if you don’t have an RBR instrument yet, you can simulate deployments and estimate battery autonomy and memory usage for different scenarios. Ruskin is easy to install and simple to use. Ruskin supports multiple simultaneous connected instruments. Easily view streaming data from connected instruments and switch between open datasets. Optimize deployment duration or sampling speed for battery or memory consumption. Interactive controls permit zooming, panning, and filtering of charted data. An interactive thumbnail view provides an overview of and quick navigation through the contents of very large datasets. 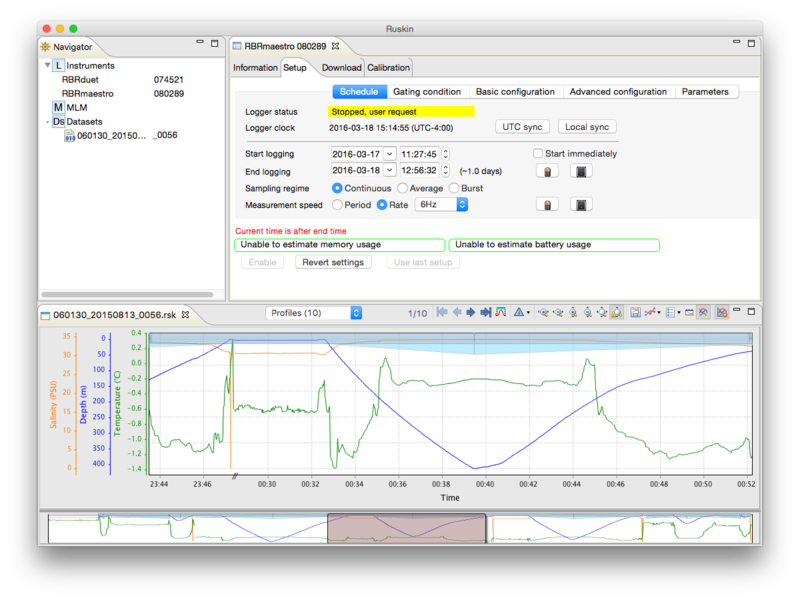 Multiple instrument interface: More than one logger can be connected to Ruskin at a time and multiple data sets can be opened at the same time. Multilanguage capability: English, French, Spanish, Polish, and Chinese. More coming soon! Flexible export: In addition to the raw logger data file (.rsk/.hex), Ruskin supports the following formats: native Matlab (.mat), OceanDataView (.odv) and Excel (.xls/.xlsx), as well as a plain ASCII (.txt) format. Plotting: When you want to check that the deployment worked out, Ruskin gives you a set of charting tools to help you visualize your data. Cast support: Use instrument-generated or post-processing-generated casts to segment your data and view as either time-based or depth-based plots. Plot output: Ruskin saves plots in PNG (bitmap) and PDF (vector) formats with the click of a button. Complete deployment simulation: If you are curious about battery autonomy or memory usage estimates, Ruskin can simulate any RBR logger and estimate the deployment resources required. Calibration: One- or two-point calibration for dissolved oxygen, pH, pressure, and turbidity. Automatic update: You don’t need to check to see if we have added new features – Ruskin will check for you. Each time you start Ruskin, it will see if there is an improved version available, and if so, ask you if you want to download it for free. Comments: It’s easy to send feedback! From the Help/Comment on Ruskin menu, you can tell us about features you think we should add, or bugs you’ve found. We recommend the EasySync ES-U-1001-A dongle using the FTDI driver. We have found that many other adapters using other chipsets do not work satisfactorily. Remember to install the driver; otherwise, the COM port will not be visible to Ruskin.